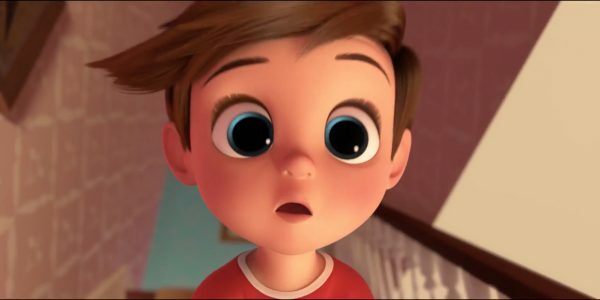 " A fresh delivery with a a bit of baby powder thrown in for good measure"
With the delivery of The Boss Baby to cinemas, it takes on the age-old challenge of explaining the origins of human babies. Based on the 2010 children’s book by Marla Frazee, audiences are introduced to the Templeton family. Ted (Jimmy Kimmel), Janice (Lisa Kudrow) and their seven-year-old son, Tim (Miles Christopher Bakshi) who relishes in his idyllic home life and being the beneficiary of all of the attention from his loving parents. Then his world is turned upside-down when a baby brother is brought home, but the tension between the boys is more than a simple sibling rivalry. His younger brother wears a suit, carries a briefcase and quickly begins to take control of everything within the Templeton household. Suspecting something is not quite right with this dapper-dressed infant, Tim begins to investigate the strange behaviors of his new sibling. 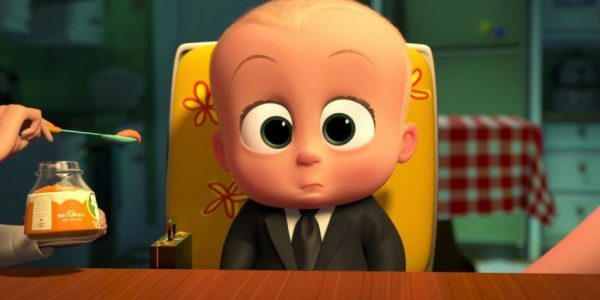 He quickly finds that the baby is actually the Boss Baby (Alec Baldwin), a special agent from Baby Corp. who is there to bring down the plans of the bitter rival to his organization, Puppy Co. These plans include all of the Middletons and will impact the very existence of babies around the world. Tim must decide whether he will help his younger sibling or expose his intentions to his parents. In a year that has few options for children, this is one of the freshest concepts in animation this year. The outlandish storyline can only be sourced from the world of children’s books, but it still offers something special for children and parents to share. Hearing the voice of Alec Baldwin coming out of a small child does take some adjustment, but as the story unfolds it becomes justified and does lay the groundwork for some of the best lines in the film. His dry wit and quick vernacular delivery are balanced out with the exceptionally active imagination of Tim. This harmonious direction provides humor that can be appreciated by parents while still entertaining the younger set. Director Tom McGrath (Madagascar) does his best to develop this unique sibling rivalry while driving home a strong message of the value of family. To some this storyline will be reminiscent of 2016’s Storks but the quality of this film proves to be written better and is a more entertaining option for families. The comedy and the writing may be considered strengths for some in this film but may prove to be the biggest difficulties for some. During many of the funniest portions of the dialogue between the brothers the only people laughing during the screening were the adults. This could potentially be interpreted that Baldwin’s style and the script were pitched a bit too high for children to access. The adults may have an issue with some of the plot points that make for some believability issues and the extended explanations of the existential elements did cause the film to be a bit too long for the younger viewing audience. Thankfully most of the action sequences did provide enough slapstick humor for children to enjoy the film. In the realm of animated adventures, it can be expected that some of the story moves to the farcical and ridiculous, which does occur with this family outing, but this does not diminish the enjoyment found in this film or the strong message for the value of families. The makers of The Boss Baby did not have some grand political ax to grind. It is refreshing to attend a film that upholds the value of family and did not try to redefine it for children. Even though the depictions of sibling rivalry are taken to an extreme, the lesson learned by the brothers was worth the price of admission. Also, the underlying message of the important role that parents play in the lives of their children is both priceless and timeless.